Thomas, who died at 98 in 2001, was a vibrant link to the industry’s pioneer period. He co-founded the national association, which initially moved under the banner, National Bottled Gas Association of America. 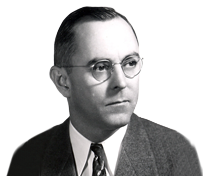 Em Thomas “moved the needle” by creating strong early propane companies and leading the association he started with Mark Anton and George Oberfell in 1931. His industry guidance was particularly expressed in safety regulation. The man who moved with his father to the Oklahoma oil and gas fields at age 6 and worked in them at 13 played a number of roles well. Entrepreneur, trade association leader and mayor were three of his hats. The common denominator was his steel-trap mind, candid and effective communication skill, vision and generosity. As association leader, Thomas was indispensible in crafting and explaining National Fire Protection Association’s (NFPA) Rule #58, which became the industry’s safety Bible in shaping industry procedures. The regulations lack neither complexity nor subtlety. Those who talk about Thomas characterize him as a master of the intricacy to which those two words point. Yet, as Stocker and another Thomas colleague discussed the patriarch’s role, it becomes clear that Thomas wasn’t simply the one at the table throughout the committee-intensive process of codifying the regulations. He was a dominant figure because of the meticulously analytical quality of his mind. Nicholson and Stocker each laughed warmly in recollecting Thomas’s legendary frugality. Yet they agreed the patriarch’s tight-fistedness offered a window on the quality of his mind. Stocker said Thomas would organize large association dinner parties. When the bill came, rather than splitting it evenly among 20 or so attendees, Thomas quickly computed what each owed. Nicholson added that one night when there might have been near 50 at the tables, Thomas directed that because he was a banker Nicholson be presented with the group check and subsequently celebrated his younger colleague after Nicholson balked at paying an imposed gratuity based on a total that included tax. Thomas’ frugality was shaped by living through the Depression. But Stocker explained that his mentor was similarly meticulous about many things: the way he dressed, talked, moved in the world, analyzed safety aspects of the propane industry, as well as who owed what. Analytical clarity was Thomas’ strong suit and that attribute showed up consistently. The quality turned up in a safety regulation experience of Nicholson. “I pointed out there was no regulation for rust and corrosion in propane tanks,” said Nicholson. “He immediately saw the importance and invited me to speak to an association Technology and Standards Committee meeting in Georgia, even though it wasn’t customary to have a non-member speak. They listened; a safety docket was formed; I became a committee member and safety was strengthened. In the same connection, Nicholson said he was initially dismayed when he observed Thomas fiercely arguing with an association colleague about a rule, only to learn shortly thereafter that the two men were the best of friends. “They were debating the finer points of the rule and not each other’s personalities,” he noted. Everyone listened when Thomas spoke on the topic of safety, Stocker added. He had equal dedication to industry communication, Nicholson noted. Although Thomas was a large stockholder in Suburban Propane, his actual business involvement waned after the early years. His primary business was his railroad leasing companies – Suburban Fuel Tank Car Co. and Continental Tank Car Co.
You don’t get to be called “Mr. Anything” by merely serving as mayor for six years, or by simply being a co-founder of an industry association. The obituaries for Thomas revealed that for more than half a century he was profoundly involved in the community. That assessment transfers seamlessly to the pioneer’s service to the propane industry: he was a servant leader acting in the best interest of all.